As seen in the screenshot above, taken from an iPhone X running iOS 11.2.5, Uber no longer shows up as a valid ride sharing option in Apple Maps. Siri's integration with the service is also non-functional. Further, the service is not available for activation in the Settings app. Normally, users can enable or disable Uber's Maps integration by navigating to the "Ride Booking Extensions" section in Settings > Maps, but that option is currently unavailable. 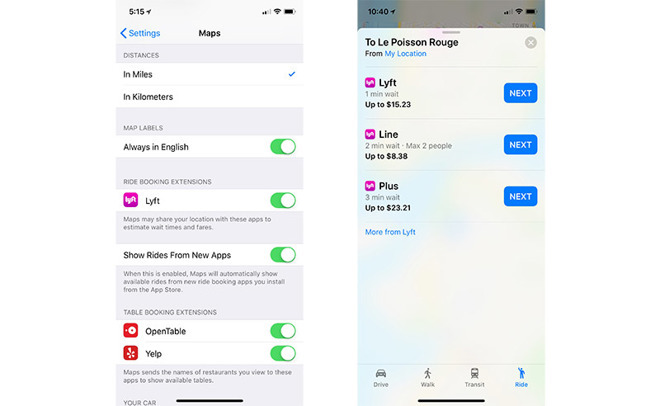 Apple's Maps extensions are working, however, as Uber competitor Lyft's ride booking extension is functioning without issue. Table booking extensions like Yelp and OpenTable are also working as expected. The problem was first spotted with the release of Uber version 3.282.10000, which was pushed out to users last week. The most interesting takeaway from the current situation isn't Uber's disappearance from Maps, but the public's reaction to it. Plainly put, it seems like no one noticed. There is little mention of the abrupt lack support online, be it on Twitter, Reddit or any of the other usual social media suspects. This dearth of chatter suggests either Uber's iOS customer base has shrunken dramatically or, more likely, few of those users rely on Maps extensions to book their rides. AppleInsider reached out to Uber for comment and will update this story when a response is received.